Take the N1 North towards Polokwane (Pietersburg). Take the Nylstroom (Modimolle) off ramp at the Kranskop toll plaza. On the R33 go all the way into Modimolle. At the main 4 way crossing turn right onto the R101 towards Naboomspruit (Mookopong) and Potgietersrus (Mokopane). Go down a little hill crossing a bridge with a dam wall on your left. Continue on this road with the mountains on your left. Before the road rejoins the N1 highway, turn left staying on the R101 going towards Mookgophong/ Naboomspruit Mokopane / Potgietersrus. Turn right at the Boekenhout station sign. There is also a brown information sign showing Nylsvley. The distance from the toll plaza to the Boekenhout turn off is about 43 km. About 7 km down this gravel road it crosses a railway line, the entrance to Nylsvley is one km further, on the left. The alternative route is to stay on the toll road, take the Mookgophong off-ramp. Keep going left, some 3 km later you each the R101 to Modimolle. Travel south (with the mountains on your right) until you pick up the Nylsvley / Boekenhout sign. 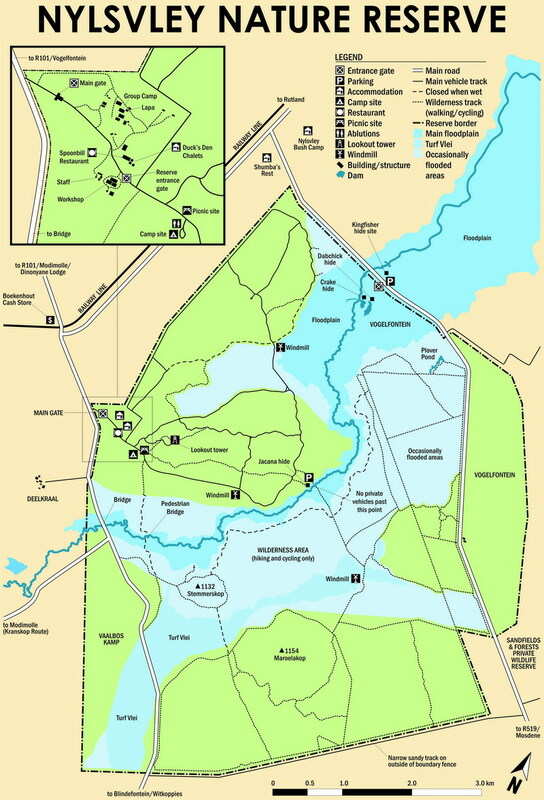 Visitors to wishing to visit Vogelfontein are asked to obtain a permit and the combination lock code from the main gate of the reserve before proceeding to Vogelfontein.